Theme: Area protection; threats to the environment. Eduardo Zavala (EZ): The Prolansate Foundation was founded in 1989 by a group of people from Tela, who had observed that we had a wealth of natural resources but that there was no authority responsible for its protection. It was then when Jeannette Blanca Inés Kawas, along with others, and supported by the Peace Corps of the United States initiated the formation of a group. Once formed, the group gave it a name, and the foundation was legally established in 1992. It obtained its legal status, which is a requirement of our country, and it began to operate with a legal structure, based on an approach which takes into account the participation of communities and advocacy in public policy and decision-making, so that the people benefit as much as possible. Our main aim is to improve the quality of life of the inhabitants of the river basins. This depends on the point of view from which you look at it, because for some people it will be that we are going to restrict the exploitation of certain resources, and for other people we are going to protect the resources. So, it depends on the particular viewpoint, how our vision is interpreted. But our vision and mission has been focused on that, improving the quality of lives of people, through giving them a good place to live, a good environment, conserving species, and preserving the quality of the environment. Prolansate has six programmes: community development, eco-tourism, environmental monitoring and conservation, environment education, project management (financial sustainability of the organisation) and technology transfer. This last programme is responsible for working more closely with communities in agriculture and production. We focus on these programmes to deal with the issues. As an institution we have evolved, we have changed, because in 1992 when we started out, our mission was purely environmental, it was to protect the fish, to protect the birds, the jaguar; but at that time the role of participation of civil society or of communities within the system of protection was not so clear. Then we moved forward in time and we have added aspects which give us greater integrity in our work. Now we work in programmes relating to health, vulnerability, climate change, or be it, on issues which although they had links to our work before, they were not part of our mission. So we have evolved because to survive you must. Donor policies have changed – they say “we want you to work in this”, so we have to go along with it. Also today civil society is more aware, the people do not sit quietly, as noted before. Nowadays people in the communities make demands, they educate themselves, they read, they learn about the laws. This has forced us to make these institutional changes. Martin Mowforth (MM): Could you explain the main problems facing the foundation? EZ: We analyse the problems from three perspectives: economic, social and environmental. On the social side, since three years ago we have had a number of serious and delicate problems. We have a group of people who constantly try to invade the core area of the parks, that is, the areas which are off-limits, which belong to the State and are for preservation. So we have different groups of people, motivated by political and economic interests, that want to invade the land so that they are given land titles which then later they can sell. There is a strong land market here. Unfortunately people have been acting wrongly and illegally. On the environmental side, we have problems related to the accelerated degradation caused by humans – for example, changing weather patterns. The birds usually come on certain dates, but now all the cycles have stopped. We also have soil erosion in the upper parts of the river basins, which will end up in the lagoons, sedimentation has been filling up the lagoons. We also have an accelerated rate of coral reef death, due to suspended sediments. We are also introducing new species, invasive species, like the lionfish which is very prominent here in the bay. On the economic side we have the tourism project Los Micos, which is currently the largest in Central America, the largest investment in Central America. It is an opportunity for Tela, for the park itself, for certain aspects of sustainability; however, the omission of a social side in the project since its start is the biggest problem, because it causes the people to speculate on land values, prompts the invasion of areas near the projects and abnormalities start to occur at the local level. MM: With regards to Astaldi and Los Micos project, are there conflicts between Astaldi and the Garífuna communities, and between the Garífuna communities and the Foundation? And is the Foundation working with Astaldi? EZ: Los Micos project consists of three main parts: the private part, which is the largest, the part of the government, which is considerable, and then the Garífuna part. The Garífuna are part of the project, they have seven per cent. The others have some 51 per cent and those, some 42 per cent. So the private part holds the majority, second the government and in third place the Garífuna communities. To implement the project, they established a company, joining the government and private enterprise, and created a joint venture called Tela Bay Touristic Development (Desarrollo Turístico Bahía de Tela, DTBT). Then they contracted a construction company, which is Astaldi. We, as Prolansate, are outside. We are part of the project because it is within the national park, but we deal with the municipality, SERNA, which is the country’s environment authority, the ICF, which is the forestry authority, the Institute of Anthropology and History, Ofraneh, the organisation for Garífuna communities. We are auditing these people, Astaldi and DTBT, with regards to the project. It is in this sense we participate. Clearly there is a conflict between the Garífuna communities and the project, but there comes a point where you could say, what is it that the Garífuna people are asking for, because there has been no clarity from the communities who say “we, as Garífuna communities want this and that”. Maybe within the project the needs of the Garífuna communities that have been posed are based on the needs that certain people in the communities have expressed, which are not the needs common to all, but those which suit this person or that person. So the project has been addressing a series of needs that have been expressed by the communities, however there are other issues such as the social side and participation. That is, the participation of the Garífuna communities in the project is not yet clear. We do not know what this participation will entail, what the real benefit will be, or the repercussions of participating in the project, so in this regard there is still no real clarity between the Garífuna communities and the project. MM: Yesterday we were with Ofraneh and they said that no other organisation or government ever listened to them. EZ: I respect Ofraneh’s mission and vision, but about 90 per cent of their views I do not share, because our vision is rather more to promote development, social development tied to economic development. But that of Ofraneh sometimes wants social development without the inclusion of the economic aspect. I do not understand how we are going to secure a quality of life without promoting work or investment – that is what I cannot understand. Yes, logically there are differences between Ofraneh and Prolansate, well because we are different institutions, but we have a common goal. Ofraneh sometimes use our technical reports, because we have produced a series of reports in which we say Los Micos project is going to affect the humidity in this or that, the Los Micos project will affect such issues. We have produced very comprehensive reports in collaboration with other institutions and universities. But when we represent a restricted (limitante?) Prolansate, we are no longer an ally and they see us as an enemy. Ofraneh have accused me of promoting the sale of land, but quite the reverse, we have supported the Garífuna communities in not dividing their titles, in preserving this heritage for their children, that is in our interest. And the interest in working with the Los Micos project is for that. It is to try and settle as much as possible, because as they say, you can make a greater change from the inside than the outside. With this we see eye to eye with Ofraneh. Ofraneh does not have the support of all the Garífuna communities. In Tomabé they do not have much support, in San Juan yes, en Triunfo de la Cruz there are two boards, one which supports Ofraneh and another which the community elected. There is a conflict between them and Ofraneh and a Garífuna organisation would be better off reconciling interests, as the issue at hand is not fighting among themselves, but rather confronting something else which is a threat. So, with Ofraneh, yes we have had some differences because it holds a very extreme position. I believe we can no longer be saying “don’t touch here, don’t fill here, don’t do that”. I believe we can no longer do this because the times have changed for good. Let us remember also that there are political and economic interests and there are projects which will go ahead regardless. So to avoid that it is better to say: it is ok for the investment to go ahead, but it has to abide by the environmental laws, with the management plan, with the international conventions, the ILO Convention 169, the Ramsar Convention, the Biodiversity Convention, among others. As institutions, it is very important that we take an integrated perspective and point of view and do not just focus ourselves on one thing in particular, because that would lead us to make errors. MM: Can you talk a little about the cultivation of African palm. I know that is a problem too. EZ: In addition to the invasions that have occurred through this area [pointing out area], we have the pressure caused by the cultivation of African palm, which for many years has been increasing because of a government law passed which encourages the production of energy from biofuels. So the people saw that it was more profitable to cultivate African palm than to have cattle and other things. So the change in land use began. African palm has had the greatest impact in the south-west. There we have a number of campesino unions or community cooperatives that have been increasing the cultivation of palm, and in the areas of Los Cerritos and Agua Chiquita. In the San Alejo sector they have not increased cultivation of palm. It is rather ironic, because in Los Cerritos and Agua Chiquita there is a lake and a lot of mountains which for many years we have been fighting to reforest and [there has been] nothing, no interest on the part of the communities. What happened? All this has contributed to soil erosion and sedimentation in the lake. And what has happened with African palm? All these hills are now covered in African palm. So we have noticed a reduction in erosion. Or, in some cases the palm has functioned as a protective cover, but the use of pesticides increases. So we have not yet measured the increase in concentrations of agrochemicals. Also, there was a comprehensive study done last year by Juan Carlos, about the impact of African palm in the entire north coast corridor. The problem with African palm is that it promotes monoculture; it does not encourage diversification or an approach based on biological corridors. So, in certain cases African palm causes a disruption of the biological corridors and has prompted a monoculture approach. Certain species can disperse and it can attract others. But the greatest impact it has on protected areas is in the southern and western areas and we have some cases of palm in the core protected area, caused by the birds or another type of animal that has [XXXX]. MM: One thing that Dennis explained three or four years ago is that African palm is slightly better than livestock, as it allows for migration [of animals]. EZ: Definitely, because with livestock what they do is knock down all the trees and plant grass, and also the ground is trampled. The point is to get a balance. The important thing is to not look at or demonise African palm or demonise tourism, but rather see how you can make a livelihood for a family, because if you go to these communities that benefit from the palm then you will see that they live very well, they have all the comforts, their economic situation is better than it was before. So you say, the people benefit from the protected area. The important thing is that this is carried out under a regulated framework, but here comes the role of the government in trying to regulate these matters, because it is the government itself that provides the incentives for it. So they should try and create policies and structures to prevent the situation getting out of hand. Dennis Sierra (DS): The national park and its zones of influence are well defined. The Inés Kawas Park is a delta of the two big rivers: one is the Ulúa River which flows into the Caribbean Sea, and the other is the Chamelecón River which forms the boundary of the park. For many years the banana companies tried to colonise the park – the whole Sula valley. So this ecosystem here is connected from the Alvarado Lake which is in Puerto Cortés up to the Tornabé Lake. It is a single ecosystem, because ecosystems do not have borders. It all forms part of this delta. MM: Another question about the case of Jeannette Kawas. Was it last year or the year before when the Inter-American Commission on Human Rights opened the case again? DS: The ruling has already been made. The government of Honduras accepted responsibility for the death of Jeannette. It is an international case and it was a death which went unpunished. Her family is being compensated by the government but that does not make Jeannette return. But there are no culprits, that is the problem, which is why the government took responsibility. Because of tourism, the rich people in this country now want to seize the land of the park, using all means at their disposal to acquire this land, which is national land. As there is a lot of corruption here, they appear with titles issued years before. I say to them “why didn’t you declare your land years ago?” In 1998 we had a meeting with all the people occupying this territory. To those living in the area, the government gave all rights. But since 2000 a whole lot of owners have been appearing, wanting the government to compensate them or wanting to develop projects. That is why we have been condemned and sometimes we have been made vulnerable, because here people personify other people … because they are a nuisance to them. MM: Could you expand on these threats which you have received? DS: In the area, because of being close to industrial activities and the cultivation of African palm and banana, the soil is threatened. This is land where the water table is very near the land surface, because it is wetland. All these channels you see here are manmade, to try and lower the water table. This channel is called Martínez and cuts the protected area in two until it comes out at the sea. This was done about 100 years ago. In that time there were no environmental laws in Honduras. The Environmental Law dates from 1994. These companies came and gave out concessions for these public lands. From the railway line that comes here, they grabbed 5km from the right side and 5km from the left, and they could do whatever they wanted – they could knock down all of the trees here, cut the wood, because that is what they had been paid for by the State, and planting. These companies were the United Fruit Company, which has already left these lands, and the Cuyamel Fruit Company, which worked from Cortés up to the border with Guatemala, the Standard Fruit Company. They are American companies which were granted these lands concessions over 100 years ago. The concessions ended and this left a big problem, as now there is no railway. MM: When did the concessions end? DS: About 20 years ago. Some of the area was inhospitable, and still is. There are parts where there are lots of mosquitoes, dengue, malaria, because it is wetland, but the people who worked for the multinationals stayed, and here the communities that are on the map emerged, the villages that were born here such as San Juan, Tornabé, Marion, Kilómetro 4, Kilómetro 15, Ramal del Tigre. It is called Kilómetro 4 because this is what the banana workers called it, these were banana plantations. In the years after they stopped growing bananas, they grew a lot of plantain, but independently. The land, which was already ready for agriculture, with the drainage and irrigation systems, has been used for various crops, for example teak and melina, fast-growing timber. Later this was replaced by palm. For between 25 and 50 years now, the land has been dedicated to the cultivation of palm. Right now there are farms which are being renovated, because after 28 years of cultivation, they are no longer productive. So they are returning to planting palm because there is a palm oil factory. They have the whole infrastructure in place. MM: This factory belongs to Miguel Facussé? DS: No, Miguel Facussé is over on the Sopo side. On this side we have Agrotor which is a public limited company, not a multinational. There is another company called Hondupalma, which belongs to some campesinos, a collective – it is on this side of El Progreso. And when you come on the road there is another company called Coapalma which belongs to independent producers, which also has its own factory and its own infrastructure for processing oil. They make soap, margarine and a range of products from palm oil. Also the quality of palm has improved. I am an agronomist. They have been improving the plant to make it more resistant to humidity, to the water table, to make it more productive, to produce up to three years, and to produce larger fruit to make better use of the oil. They have genetically improved the variety of African palm. One of the things which I like to talk about, because I studied agriculture, is the Lancetilla Botanical Garden, the birthplace of African palm in Latin America. Here African palm was born in United Fruit Company’s laboratory. Lancetilla Botanical Garden was born from the United Fruit Company, and has species from around the world: mangosteen, rambutan, these are from Asia. I studied in Brazil and the Brazilian technical experts had to come here to Honduras to see the techniques of cultivation, to see how to produce more per hectare, how many plants per hectare, which species were being planted. And then people also came from Malaysia to study here, at San Alejo, the cultivation of dende or African palm. Even Malaysia improved the variety of African palm and now the Hondurans are bringing varieties from Malaysia to plant here. MM: Does the Foundation have programmes on climate change? DS: We do not have a defined programme, but Prolansate is an active member of IUCN, the International Union for Conservation of Nature, and there is a technical office for the Mesoamerica region from Panama to Mexico. This office has the expertise and they are informing us of activities on climate change. With NOA there is also a change in cooperation and thanks to this cooperation we have been solving problems that we ourselves would not have been able to solve without the technical expertise necessary for the environmental issues we face in the corridor that we are managing. From Trujillo there are several NGOs that are organised in a network. There are about ten organisations: Prolansate, Funapid, Fucawua, Fucsa, Fundación Nombre de Dios. They formed a network to look at the issue of climate change. They inform us and we inform Tela civil society about the problem of climate change. They also do monitoring. There is a state organisation called Copeco (Comisión Permanente de Contingencias en Honduras), which is also at the forefront of this, with satellite photo footage – there are people well-trained in it. We know that in Central America we are in a vulnerable place. Right now we are in the hurricane season, for example, so we are on the alert. We are part of that. 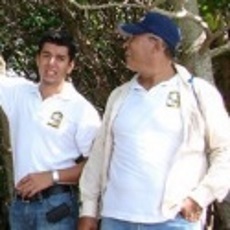 We have some early warning systems; we have some shelters (casetas) here in agreement with the municipalities of Puerto Cortés and Tela, where there is a Copeco office, so we are exchanging information with them in case of any emergency that might happen, because there are always problems when managing these rivers. MM: Can you explain the problems with fishing? I explained to Eduardo that yesterday we spent some time with Ofraneh, and they explained the problems faced by the fishermen and conflicts with organisations. DS: Throughout our Caribbean coast, we have a number of villages, and these people use the resources, but there has not been any standard for regulating the use. Unfortunately, Honduras is a disorganised country. We are in the process of ordering, and the people do not like it when order and regulations for use start being put in place. The fisheries are over-exploited in all of the Caribbean, not only in Honduras – the same in Nicaragua, and in Guatemala the problem is much more serious than in Honduras. Here we have a lot more resources than in Guatemala. Belize, which is a country where fishermen are well organised. I say this because we as Prolansate work in protecting the Gulf of Honduras, which is much bigger, and so we have connections. Currently, Prolansate is the secretariat of the trinacional, some 89 organisations working in the coast part, for the protection of an ecosystem much larger than this, the Gulf of Honduras. It concerns four countries: Mexico, Belize, Guatemala, and Honduras. All the animals that move here, that large biomass is related, they move in the Gulf, and all the users who are around the Gulf make use of this, but there are different closed seasons for fishing. About five years ago we started coordinating the fishing closures to happen at the same time, not at different times. What happened before, when Belize had the closed season the fishermen could not fish in the waters of Belize, but the Hondurans and Guatemalans went fishing to Belize, and Belize has an English law a lot stronger than ours. So the Belizean patrol would capture these fishermen, take their fishing tackle from them, the vessel, everything, and take them prisoners. And on that Ofraneh said nothing, they stayed quiet. MM: The problem for the Garífuna is that if there is a ban for several months, what do the artisanal fishermen do? Because they do not have any other means of survival – that is their livelihood. DS: We are aware of the Garífuna. When we have a closed season, what stops is the commercialization (marketing?). Why did Honduras name these areas Jeannette Kawas? Because these sites are very important for maintaining the biodiversity of the sea. In these coastal lagoons the mangroves are like the birthplace where the fish are born or for species such as shrimp or snails, the larvae come out from these lagoons and into the ocean, but if we come and fish in these areas where they reproduce … but here there are also people, fishing communities, all those villages dedicated to fishing, because it is a resource. Here then we start to make regulations and say to them, “you cannot fish within 50 metres of the lagoon, it is prohibited”, because they are taking away the small fish, they cannot throw their nets (chinchorros) in the biological corridors. They are used to throwing their nets in the mouths of the lagoons and the rivers, which are biological corridors and maintain the life of the sea species, of the lagoon and of the rivers. So we put regulations in these zones, measuring a kilometre here and a kilometre there, and trawling is prohibited, fishing with hooks is permitted, and with atarraya, so that the species can make their life cycle. But without the use of nets, only small nets. This was discussed with the fishermen, not imposed, because they themselves were aware of the problem. Now there are many fishermen, not like before. The number of fishermen has doubled due to unemployment, for whatever reason, those that are not doing anything at home become fishermen. Many of them here are not even registered as fishermen, because the government requires that all Hondurans born in Honduras have to present themselves at the Directorate of Fisheries to register as a fisherman and they have to pay for a small license, it costs around $2 for a fishing license. A fisherman makes $2 in a day, easy. The fishermen are not organised, we at Prolansate have tried to organise them. We have two cooperatives that are more or less organised, but there are a lot of people. We want to work like in Belize where there are fishermen cooperatives that work really well. We have had exchanges between the Honduran and Belizean fishermen so that those here learn how to manage the resources, because here the problem is they have the resources and they cannot manage them and they want to do the same things that their great-great-grandparents did. At that time the problems we have now did not exist, there was no climate change, there was no overpopulation, there was no drug trafficking, well, a whole lot of things, and the people did what they wanted and there was no law. Currently this country has a Protected Areas Law and the Garífuna want to continue doing things like their grandparents did. When they come they want to fight. I tell them “you are not from these countries, you came from Africa and you have to adapt to the laws of this country, you are Honduran”. Our natives were displaced by them, the true natives of Honduras were the Tolupanes, the people that inhabited the coast from here. The Garífuna were people that lived on the islands and mixed with the Indians that lived on the islands, but they came here to the coasts and displaced the tribes who were not warriors, they were harvesters. I know the history well, I am a good friend of the Garífuna, I have even defended them with regard to their territories, because they are also under threat of being displaced, but they too have to comply with the laws of the country; they cannot stay isolated, they have to be integrated to see the problems which they have, because they have a whole lot of problems like their ethnicity, which came from outside, because they do not really come from here; they came from outside, from Africa, and they came because the Spanish brought them as slaves, but they showed themselves in San Andrés and came to the coast of Central America. Even recently we supported the celebration of 213 years of having the Garifuna communities here in the park, in Río Quinto, Saraguaina, Tornabé and San Juan. We have Garífuna communities and they are protected within the park, but they must also abide by the regulations of the management plan which specifies how to use the resources in a sustainable way. So those here have to adapt to that management plan. These organisations, Ofraneh and Odeco have their headquarters in La Ceiba, and sometimes they want to impose things on the villages here who are sometimes not in agreement, as has happened in San Juan and in Tornabé. Ofraneh wants to come with their lawyers and put regulations on the ethnic group, and they do not want to accept it. They say, “no, that does not suit us”. It suits Ofraneh but it does not suit Tornabé, because they are the ones that live there. This has come about a lot with the development of tourism. There is fighting between them, between Ofraneh and Odeco which are the two Garifuna NGOs, but which look out for their own interests, not the interests of the people of Tornabé or the people of San Juan; so sometimes they turn against each other within the same community. As stewards of the resources in that area, we look at this problem and we tell them, “the problems in your communities and with your ethnic group, you sort out”, we cannot intervene, but for the problems with the resources, yes we can intervene, because we have to come and regulate it. We have problems with shark species for example. The shark is a species that is being threatened throughout the whole coast of Honduras, because people without a license come from Jamaica and elsewhere. They arrive at the black communities and then fishing becomes underground because they start fishing illegally but with the consent of a fisherman from some village who is taking money in return. After drug trafficking, illegal fishing and other matters related to fauna is the most profitable. Then they kill the sharks and just take away the fins, dumping the carcasses. The other day we did a tour because a big boat came from Jamaica. I found more than 100 shark carcasses of various species, with only the fins cut off. I have photos. That is the problem with illegal/underground fishing. Not all the communities do this, but yes there are people from here that do it and we have to find out which people. Then they turn to Ofraneh and Odeco to ask them to defend them. It is enough to say that they are Garífuna, who are an ethnic group and we cannot regulate them because they are within their own territory; and then come the conflicts. We have to struggle with this, and come out as best we can, because this is engaging in conflict, and conflict is not good. Because of this we have some surveillance committees within the community, so that the people that consider themselves smarter than others do not do this, and so it is reported to the authorities, because Prolansate is not an authority. This type of problem arises with resource management. We have illegal fishing, poaching. Having this large area of land where people live and coexist with wildlife, we are going to have these types of problems. MM: We have heard a story yesterday from Ofraneh about the problem of … over there where a Garifuna was killed by soldiers. MM: They wondered if Fucsa has the right to carry soldiers and shoot at the fishermen, even if the fishermen are doing illegal things. Do the administrative organisations have that right? DS: They do not have the right to kill. No-one has the right to take the life of another human being, because there are always circumstances and human error. Fucsa is an area which is very well operated, but there is a very enigmatic species there, the manatee. They do not have a large lagoon, there are small lagoons and here the manatees live. There the area is smaller than in Jeannette Kawas [National Park]; they have a contingent from the naval base; they are in the mouth of the sand bar; there is a wildlife refuge. It is not us who are in a park. A wildlife refuge is a stricter category, because it refers to looking after the manatee and the manatee leave the sea and enter the lagoons and the channels. Many years ago, the people here from Triunfo de la Cruz travelled in canoes with outboard motors up to Tres Bocas, in the sand bar area of the Rivers Cuero and Salado, usually going at night. As Hondurans, we cannot ignore the drug trafficking that goes on in this area. There are armed groups, not only military, but also from the paramilitaries. One does not know who they will run into when travelling in the sea at night. That military contingent from the Navy is a patrol of four soldiers who are assigned to patrol the area so that the manatees are not killed. They check to see if the boats are carrying manatee. I know because one of my guards was over there with those fishermen and apparently the soldiers confused the boat for drug traffickers, so they stopped the boat, but apparently they the fishermen took no notice and they were shot. That is the story I was told. They shot a fisherman. I cannot hide the fact that many of the fishermen fish … cocaine paste, because the planes fly by here and throw out packages [bultos], and many fishermen are collecting these … because they get paid and they get involved. We cannot do anything. Already they have got hold of the people involved in that drug trafficking. Like in Mexico where right now there is a drug trafficking war on the border, the personnel here are told to check all the boats to see if there are any drugs and fishermen are not exempt from this inspection. If I am stopped and I refuse to stop and make off running, then the army has the license to shoot at me. That is what happened there. It is not that the fishermen want to catch the manatee, but as they fish in the mouths of the rivers and throw a trawling net around the mouth, that is in a protected area, and that constitutes a crime. But they do it because it is a biological corridor and there are many species, so when they bring in the net – it is a net that they pull in by hand, it is hard work, it is not an easy job – they get a number of species and sometimes the manatee comes in the net, and many times because it is dragged the manatees die young, then the fisherman with the dead animal knows he has committed a crime and wants to hide it. Or he butchers the animal and makes it into meat. But it is not that they go there specifically to hunt manatees. I had the opportunity to work at lot with fishermen from Triunfo de la Cruz. We were even having an influence on the community so that they would not capture or eat the manatee, because it is a species in danger of extinction. Many fishermen were cooperating, but not all, there are some who resist it because they say the manatee was eaten by their grandparents, that it was used to cure disease. The issue becomes problematic when there is a law. Manatees in the Garífuna culture are enigmatic animals that are used for medical matters, they say that it has a rich fleshy meat. We have to understand the cultural significance as well. That was an isolated incident, perhaps through no fault of my colleagues there, because I have had such problems here. They come and fish in the estuary of the Martínez channel. There in the Martínez channel there are manatees which enter the channel and go out to sea, and if you throw a net and catch the manatee and there is a small manatee, that manatee is going to die, and that is what happened there. I had a resource guard in the area and he sent a note, that a manatee was killed and eaten. I dismissed the guard, because I cannot tolerate a person who is working with me in conservation, who then participates in the eating of manatee, because he has a commitment to the organisation. I cannot go to the Quinto River and eat a manatee, I am not part of that. Our job is not easy, we have to deal with people, and all people are different, and with natural resources, how to conserve these resources. We must start educating our communities in how to manage the resources. The problem is that we have the resources and we cannot manage them communally, although they say that they can. Although they lack education, our communities are very willing to be educated, our communities are not stupid, the Garífuna are not stupid, they know what they have, but as the proverb goes, it’s good fishing in troubled waters [un río revuelto hay ganancia de muchos pescadores], so sometimes we cannot confuse the interests of Prolansate. This business of natural resources is broad and there are many actors – NGOs, cooperatives, private companies, people in organised crime, government people, from the army – we cannot ignore them. I am a person that when I am working with the military, I do not leave them alone. You have to be there, otherwise there could be some problem, because these people often do not have defined interests and we cannot forget that we are a corridor through which thousands of tonnes of drugs pass to the north and a lot of planes work at night. About ten years ago I used go patrolling during the night, but since about five years ago I have not patrolled because there is a lot of trafficking in the night and we are in a vulnerable area. We have no police presence and sometimes the police themselves are not reliable. So, we live in the uncertainty of not trusting our own authorities. We have said this to the government ministers, that the police themselves there are problems, and in the military too. If some incident happens for X reason, it is necessary to open an investigation, to find out why Jeannette was killed for instance. Why was Jeannette killed? This is the question I ask myself. Jeannette was a person like you, like her, who lived here at home, and who came to protect this forest that still exists, because as things stand there are many people who do not want that forest. They want quick dollars, because we live in a consumer society where the faster we get money the better. I personally very much regret the death of Jeannette, I knew her personally. Many times I advised her, I said to her: you can’t do that like this – this is when all the newspapers of Honduras take photos of you, there is your photo and whatever person that wants to can identify you, and it is very easy to kill you for 500 lempiras. These are all the problems that we face and we are aware of them. Right now these people come and I say to them, why did you not legalise your holding when the park was created, and not until now, when there is plenty of investment. The Garífuna community itself is being displaced, because there are two ways of being displaced: one by force or murder, or with money, and ill-gotten money at times. So, we are faced with a big challenge, to maintain our communities and develop them sustainably or these things will disappear, so the fight is that. In fact sometimes working on this, you can get disillusioned that there is no equity. Governments speak of equity and it is just lip service. Here there is much poverty, even though we are rich in resources.